Alanis Morissette, Hilary Duff and Choking Victim are faves of our teen reviewers. Nadine, 14, found other ways to check out live music after Lollapalooza was canceled. Essay contest winners describe the hardest part of being female. These are letters we received about stories in the May – June 2004 issue of L.A. Youth. A girl and her family went through hell after her mom started dating a new guy. Growing up, I didn’t have a perfect family, but all of us were happy. My mom never actually said she loved us but she was always there and gave us what we needed. She signed us up for sports, came to our open houses and took us to Chuck E. Cheese’s when we got our report cards. Everything was going pretty good. Because I was a little kid, I still expected people to be nice to each other and good things to happen to me. But things changed when I was 10. My mom ran into an old acquaintance and he came over to our house the same day. They immediately started dating. The beginning of their relationship was like a fairy tale. He was the dad I had always wanted. He made us feel like part of his family by taking us out to dinner and the movies. He was always making his kids laugh and giving them hugs. He set rules for them that were really strict but I assumed it was because he was worried about them. For the next few months he continued to come over and spend time with us. It felt so right. But after four months my mom started to change. She didn’t go out as much. She made up excuses to avoid taking my younger sister and me to our sports and Girl Scouts. She said, "You guys don’t need to go anyway." Soon we weren’t allowed to go anywhere with my mom, unless he was with us. He would tell us straight up, "You’re not going because I said so." He wanted my mom to be home as much as possible. When she went out with him, she wasn’t allowed to even look at other guys because he was afraid she’d leave him for someone else. He put her down and made her feel bad about herself. If my mom joked around about leaving him, he’d get serious and say, "You can’t live without me. You know you need me." Or "No one else will want you, you’re nothing." After they had been together about six months, I heard my mom crying at night. It was the first time I had seen my mom cry. My sisters and I went to her, but she didn’t tell us why she was crying. The second time she told us that he had slapped her. I also saw him whip his kids with a belt or slap them on the face. The loving father he had pretended to be was nothing but a lie. I felt so bad for my mom. I felt like it was my fault because I couldn’t do anything to stop it. I wondered, "Why is he doing this?" Then we moved in with him. He was very controlling. He made my mom cut her hair short like a man and wear really short dresses. She had hickies on her neck that looked like dog bites. She hated it. He made us and his kids clean his house. My older sister wasn’t around a lot and my younger sister was too young to say anything. But I tried to stand up to him when he said things to my mom and us. When I did that, he would threaten to whip me with a belt. A few times, he actually hit me. My mom always chose him over us. One time he told me to clean the kitchen, but I didn’t hear what he said. When I asked again he whipped me with a belt and threw a chair on me. Later that night I told him, "You can’t hit me because you don’t have permission." I looked over at my mom and asked her if she had given him permission, but she wouldn’t stand up for me. She looked as though she was about to cry. She had this empty look in her eyes like she wasn’t in her body. I tried all sorts of things but nothing worked. Some nights I prayed to God for him to go away but God never answered my prayers. I threatened to call the cops but I was too scared that they’d take us away from my mom. One day I packed my stuff in a little kid suitcase and asked my little sister to run away with me. I said that we would go find our dad. But she was too young and too scared to actually go. Even though I wanted to leave, I was afraid to leave my mom. If she was going to be put through that, I did not want her to be alone. I told my mom that she needed to break up with him, that what he was doing was wrong. She said, "But he loves me" or "We care about each other." I didn’t talk to anyone about what was going on because I was afraid of being taken away from my mom. At school I slowly stopped talking to my friends and started hanging out by myself in the bathroom stalls. At recess, I hung out by myself and collected rocks instead of playing tetherball. I didn’t want to be accepted by anyone because I was feeling bad about myself. My mom saw that I was having problems so she signed me up for therapy. My therapist wanted us to go to family therapy. While there, the therapist told my mom she should break up with him because he was tearing our family apart. Friends and family had been telling her she needed to break up with him, too. It all finally got to her. After eight months, she told us one day, "I broke up with him." I was happy, but I didn’t know how to express happiness anymore. My family doesn’t talk when bad things happen, so we just acted like the family was OK again. After about two months, my mom started going to "the store" for three hours and wouldn’t let us go with her. I got suspicious. I yelled and asked her again and again, "You’re back with him, aren’t you?" She finally admitted that she was. I felt like dying, but instead I did nothing. It was extremely hard because they were off and on for the next two years. She would break up with him and we’d all think it was over. A few weeks later she’d be back with him, sneaking around because she knew I’d be angry. When I found out, I’d give her the usual lecture. I’d tell her that he wasn’t the right person for her and she was being brainwashed. She would look at me like she knew it was the truth, but she was stuck. I yelled at him a lot. If he was talking crap about my mom I would say "Leave her alone" or cuss him out. Then he would say things to make me feel bad. My mind was always on my mom. In sixth grade I started missing a day or two of school a week because I was depressed. Eventually, I stopped going to school altogether. At the end of sixth grade, the Department of Children & Family Services came to talk to me about why I was missing so much school. I said I was having problems getting along with other students. Nothing happened right away. They said they would check back with me in a few months. I wanted a new start so I went to a new school in seventh grade. It was OK at first. After school I went to a day treatment center where I had a therapist and did art therapy to work on my anger. I was also put on medication. But at school I didn’t feel like I fit in. I would ditch class and use my bus pass to go around the city. After three months I stopped going to school again. I started eating a lot. I would only leave the house to go to the store once a week. I was a hermit. When he came to the house I cussed him out so he stopped coming inside. He would knock on the door and wait for my mom in the car. I hated his guts and I called him "psychopathic idiotic." I even made up a song about it and sang it really loud when my mom was on the phone with him. That November, she told him she wanted to break up with him, then didn’t come home that night. I stayed up all night waiting for her. I tried to watch TV to get my mind off where she was, but I was watching the clock. I was so scared. I didn’t know if she was still alive. I believed he would have killed her just so no one else could have her. At around 2 a.m., I tried to call his house but the phone just rang. When she got back, she told me he had kidnapped her. She had a big knot on her forehead. First she said she accidentally hit her head on the cupboard. But two days later she admitted that he had head-butted her. I was scared but there was nothing I could do. She took pictures to show the cops to get a restraining order, but within two weeks she was with him again. In February, my assistant principal and school psychologist came to my house for a meeting because I wasn’t at school. A month later, I was placed in foster care because of my truancy. 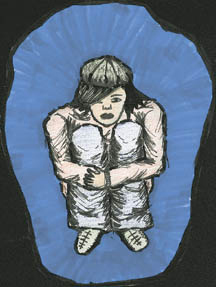 I was put in a group home with five other girls who had all been removed from their homes. I was so depressed, I didn’t even care about leaving my family. Two months later, on my 13th birthday, my mom told me she broke up with him for good. I didn’t feel anything because I figured she was going to get back with him. But she didn’t. Even though he was gone, it would take me a long time to realize I needed help. I would have to work on how I felt about my mom and about myself. I had shoved the hurt down for so long that it had caused a huge chain reaction. I didn’t know who I was anymore. His always threatening to hit us made me afraid and intimidated by other people. I had never felt so much anger, hurt and humiliation. I didn’t see the world as a happy place anymore. I didn’t like myself and I didn’t think I could ever be happy again. I was allowed to go home on weekends. At first I would scream and yell at my mom: "It’s your fault I’m in the group home." I wanted to make her feel guilty. He was gone and I had no one else to take my anger out on. In eighth grade, with the help of my school therapist, I talked about it with my mom for the first time without her saying "Get over it" when I told her it was her fault. I talked about how it made me feel. She looked like she was about to cry, but she didn’t apologize. She never has. She said he was controlling her and it wasn’t her fault. It took another two years of therapy to finally get over being angry at my mom. My relationship with my mom is better now. I can have a conversation with her without bringing him up. Through therapy I realized that even though he treated her bad, she was used to it because her dad was a jerk. So my mom had learned that the meaning of love was abuse. This experience has stained me. I don’t smile very often and I prefer to be by myself. I worry about what people will think so I don’t give them a chance to get to know me. I’m only affectionate toward my nieces. I’m not good at expressing my emotions to anyone. It amazes and depresses me at the same time to know that so much pain could be caused by one person. The family’s doing OK now, but we’re not as close as we were before. There’s a big wall between us because we all dealt with what happened in different ways. I’m doing a lot better, although I still keep my emotions bottled up. Now when I’m angry with other people, I write poetry and make collages about the pain I feel. Sometimes I think the anger inside will never go away. I still have a lot of unanswered questions, like "Why did this happen to me?" I think that you have to go through things in life to learn lessons. Maybe this lesson was to help me deal with hard times that will come along in the future. It was a long struggle staying in school, but I made it! I graduated in August and plan to attend college. I want to be a psychologist or a lawyer. Now that I’m emancipated from the foster care system, I feel a lot more free, and that relieves a lot of stress. But at times I worry that history will repeat itself, that someone will hurt me and I’ll stop going to school and doing everything in my life that means something to me. I’m trying to stay positive.